Thanks to Google I get to see when someone writes about me, so I read an article by Ryan Bourne in CityAM. It basically says that while Keynesians keep saying that their models have been vindicated by the economic effects of austerity (but economists always disagree with each other blah blah), they have lost the political debate. In the case of the UK, even Labour is no longer Keynesian. While Labour are planning hardly any additional austerity, but the Conservatives are planning a lot, according to Mr. Bourne Labour are not justifying this less contractionary stance in Keynesian terms. For the sake of argument, let us assume that Mr. Bourne is correct about Labour. We also need to ignore the SNP of course. Suppose Mr. Bourne is right that Keynesians have lost the political argument. This line is not new, with more authoritative newspapers having said similar things in the past. What should seem very strange is that Mr. Bourne and others do not appear to view this as a cause for concern. It is a concern because Keynesian economics is taught to pretty well every student who ever studies economics anywhere in the world, and usually not as just one competing theory among many but as how the world works. Nor is it the case that academic macroeconomists are hopeless divided over the issue: a large majority on both sides of the Atlantic agree that fiscal austerity/stimulus reduces/enhances growth when monetary policy cannot offset its impact. Most major central banks use Keynesian theory as a basis for their monetary policy decisions. The reason for all this is that the evidence overwhelmingly backs Keynesian ideas, including that fiscal contraction tends to reduce output. Given all this, if all three major UK political parties are ignoring Keynesian economics that would be a real worry. Now this might not worry Mr. Bourne if he was just one of these politicos for whom politics creates its own truth and that is all that matters. However he is in fact head of public policy at an outfit called the Institute of Economic Affairs. Perhaps, given the level of debate about fiscal policy in the media nowadays, that would be economic affairs of the more homely kind. To see why it is ludicrous, you just need to note that - by definition - labour productivity is output divided by employment, and that over the medium to long run living standards are largely determined by productivity. So to try and take credit for strong employment growth despite lack of output growth is to take credit for poor productivity growth (or, in the UK case, the virtual absence of productivity growth over the last five years). Which is very close to wanting to take credit for the lack of growth in real incomes. In short, it is output that matters, not employment. Employment growth due to output growth is good, but employment growth without output growth is not. To extol employment growth without output growth could be described as a luddite point of view! The half-truth concerns the distributional impact of a recession. On average we are worse off in a recession, but those that really feel it are workers that lose their jobs. For a given level of output in a recession, it would be better if the pain was evenly spread through cuts in living standards and little increase in unemployment. So, if (and this if is critical) productivity growth just paused during a recession, but then made up for all the lost ground afterwards, that would probably be a good thing. So, in that very specific sense, lack of productivity growth might be a good thing given the lack of a recovery, on the assumption that we get it all back again later. However I doubt very much whether the government would want to take credit for stagnant productivity during their term of office for two reasons. First, it probably has very little to do with them, and rather more to do with the flexible labour markets encouraged by their predecessors. Second, there are very strong doubts that we will get back all the lost productivity growth: the OBR is assuming we get back virtually none. So to claim credit for strong employment growth is the same as claiming credit for poor productivity, and it is hypocritical to try to do the first and not the second. Given that many economists argue that poor productivity growth is our number one problem right now, implicitly claiming credit for creating the problem in the first place is somewhat bizarre. There are many reasons to doubt the ‘quality’ of the employment growth (see for example David Blanchflower (pdf)), but that is not my concern here, except in so far as that helps explain lack of productivity. Although this highly unusual lack of productivity growth after a recession pretty well coincides with the period of the coalition government, it is far from clear whether there is a connection or not. If poor productivity is down to firms using workers rather than capital because the recession plus austerity has pushed down wages, then there is a connection between austerity and poor productivity. However other explanations are equally possible, which is why it is called the UK productivity puzzle. There has been some talk recently about what is wrong with macroeconomics. (Jérémie Cohen-Setton has a good summary, although non-economists are allowed to do a bit of skipping. And yes, I am a little late on this - cannot think why.) Of course there is always talk of this kind - it just ebbs and flows. But I think this recent upsurge has missed an important point (which, as is often the case, is an elaboration of a point already made by Paul Krugman). . Many of the complaints about macro are along the lines that it needs more models involving X. Now X can be many things: a financial sector, nonlinearities, multiple equilibria etc. Yet as anyone who is involved in modern macro knows, pretty well whatever X is, there are models that have those things. If you want chapter and verse on this, see Tony Yates (as in here). Indeed, one of the characteristics of modern macro, as opposed to the stuff I dimly remember from my youth, is the huge variety of approaches on offer. In that sense, academic macro is flourishing. Does that mean the critics are wrong? Not necessarily. I think what is missing in this discussion is the concept of a received wisdom which non-academics (including politicians and civil servants) can readily access. There may be plenty of models which allow for recessions to persist indefinitely, for example, but the received wisdom might still be that recessions are temporary affairs caused by price stickiness and therefore the economy always ‘self-corrects’. So the criticism should not be that there is no analysis of X, but that X is not part of the received wisdom. A related point can be made about the financial crisis. It is not the case that we need a whole new set of economic tools to understand financial crises: it turns out we had most of the tools already. (Most, not all - see for example the reference here to the Bank of England’s work on networks). The problem was more the received wisdom, which was that the problems that the financial system had shown in the past had been solved, and so we could just ignore them. Once that received wisdom was shattered, there were plenty of tools in the toolbox to analyse what had gone wrong. So where exactly is this received wisdom of which I speak? An obvious place to look is the textbooks we use. However the pace at which the subject moves (often propelled by events) means they are far from a perfect source, and they are not that accessible for non-economists. In the sciences the received wisdom is normally common knowledge among academics; in macroeconomics less so. One place you will clearly find it is in institutions that have to use that knowledge to do their job. So there is clearly a received wisdom about monetary policy, and you will find it among the economists in central banks. That is why I’m happy to talk about the New Keynesian model being the consensus model as far as business cycles are concerned, because that is the case in central banks. Others have disagreed with this consensus label, but often because they are thinking about the lack of consensus among the wider academic community. Sometimes you can go further still, and argue that the received wisdom in an institution can be found quite precisely in the model that they use to forecast and do policy analysis. I think this way of thinking can help us understand one reason why governments across the globe have so easily failed by implementing premature austerity. In the past, and perhaps if they did not have an independent central bank, they would probably have had in house capacity (and perhaps a model) to know what damage austerity would cause. But with the widespread adoption of independent central banks, that capacity has faded. Finance ministries have lost that expertise, and become much more about expenditure control. Independent central banks had the knowledge to know that fiscal austerity would be damaging, but for a variety of reasons typically chose not to express it. Without a clear sense of received wisdom, policymakers are at the mercy of policy entrepreneurs or ideology-based think tanks, and may be unaware that the line they are being sold might be viewed as rubbish by many academics. That of course is putting it very charitably: the problem may be that the policymaker is fully aware of what they are doing, but know they can get away with it because the media is unaware of any received wisdom, or may find it difficult to express. Whichever it is, it suggests one particular route by which independent central banks are part of the reason for the persistence of the Great Recession. By locating the received wisdom about fiscal policy in an institution that was unwilling to express this wisdom, that wisdom was effectively lost. It was perhaps inevitable that when output did start growing again in 2013, everyone would breathe a huge sigh of relief, and extol what was happening. But that time has passed, and yet mediamacro - with few exceptions - has not told people the truth about the recovery. What they have not said is that the recovery does not really deserve that name. This picture tells you why. The first point is to stop talking about GDP, and start talking about GDP per head. An economy that grows because it has more people in it is not obviously a good or bad thing, and from the government’s point of view - given its (missed) net migration target - it represents a failure. It is GDP per head that determines living standards, which is what matters. Now if you were on a journey, and in one part of your journey you were delayed by 10 minutes because of a traffic jam, you would be relieved when that jam came to an end, but would you call moving again a recovery? Surely you would only talk about a recovery if you made up for some of that lost time. As the chart shows, we have failed as yet to make up for any of the ground lost not just in the 2009 recession, but also ground lost as a result of fiscal austerity in 2010 and 2011. So we have not really seen a recovery. Maybe the pessimists are right, and we will never recover any of that lost output, but still you do not call it a recovery. I can put it another way. Quarterly growth in GDP per head since the beginning of 2013 has averaged about 2% at an annual rate. That is below the average growth rate since 1955. A recovery from a deep recession would have growth rates well above the long term average. So current growth is unexceptional, and nothing to write home about. The half-truth here is that growth elsewhere has also been poor, but largely because other countries have also implemented premature fiscal austerity. (In terms of GDP per head, both the US and Japan have done better than the UK since the recession.) But even GDP per head may be giving us an overoptimistic picture about average living standards. I’m going to break my one chart rule for this series to add this from the ONS. 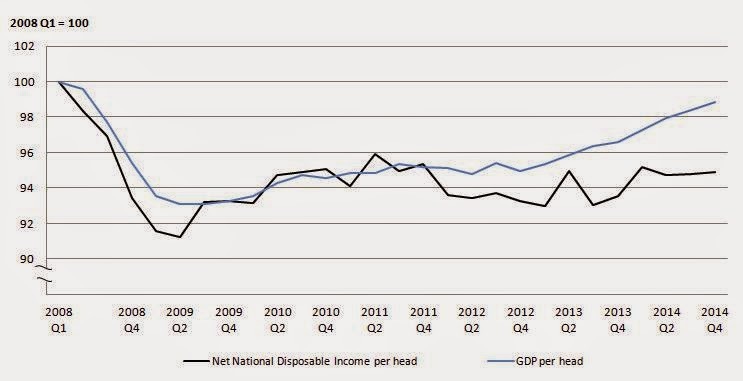 It plots GDP per head, and Net National Disposable Income (NNDI). The first measures production per head before depreciation, whereas NNDI measures income per head after depreciation. NNDI has not increased at all under the coalition government, and the reason is that while overseas agents have been receiving some of the income from UK production, domestic residents’ income from overseas production has not been increasing by as much. This is a key reason why the UK current account deficit has been increasing. In a nutshell, the prosperity of the average citizen in this country has hardly increased over the period of this coalition government - a result that is totally unprecedented since at least WWII. As recoveries from recessions go, this does not seem like a recovery worthy of the name. Yet we keep being told by mediamacro that the Coalition’s strong card is its economic record! The idea that austerity during the first two years of the coalition government was vindicated by the 2013 recovery is so ludicrous that it is almost embarrassing to have to explain why. The half-truths in this case are so flimsy they do not deserve that label. I can think of two reasons why that claim could have any credibility. The first is that people confuse levels and rates or change. The second is that some critics of austerity might have occasionally overstated their case. To see the first point, imagine that a government on a whim decided to close down half the economy for a year. That would be a crazy thing to do, and with only half as much produced everyone would be a lot poorer. However a year later when that half of the economy started up again, economic growth would be around 100%. The government could claim that this miraculous recovery vindicated its decision to close half the economy down the year before. That would be absurd, but it is a pretty good analogy with claiming that the 2013 recovery vindicated 2010 austerity. And please, before anyone comments about how fast employment has grown, look at the data for unemployment - it went up in 2011. The deeper problems with the 'didn't we do well on employment' line will be addressed in the penultimate post in this series. If it is close, do not discount some sort of deal with the LibDems too (under new leadership). In addition, if Labour does well, do not rule out a coalition with the LibDems to exclude the SNP. Zone B: In between M and C, where Lab+SNP get between 290 and 315 seats, where it is all down to the Liberal Democrats. This analysis by Harry Lambert is excellent in detail, but I think the overall gloss that Miliband is now the favourite is misleading if you read the text. Labour needs all the seats in which it is currently favoured, plus a few surprises. Electionforecast currently have the most likely outcome as Lab+SNP=315, which means we are just in Zone B. 1) The Conservatives have more seats than Labour (which assumes the SNP do as well as predicted). If Con>Lab+SNP this will carry some weight; if not less so. 2) Not working in a government dependent on a party that wants to break up the UK. I think this is a highly undemocratic argument, one that can ironically only hasten the break-up of the UK, and it becomes particularly odd if the alternative is a government dependent on the DUP. Incidentally it is also a stance that does the LibDems no favours in trying to keep (or ever win back) their Scottish seats. 3) Labour are not offering such a good deal. What Labour can do is try and pre-empt this last argument by (if necessary) making the deal they are prepared to do public, so that the party sees what is on offer. Which means they need to think this through before 7th May. In the end the LibDems got nothing from their current coalition on voting reform, and Labour could offer them something for sure. Not having to worry about a European referendum would also be attractive to the LibDems, particularly as Cameron could well advocate leaving. Labour could also be flexible about the type of arrangement: it could be a formal coalition, or it could be simply an understanding (that Miliband should be PM), but otherwise the LibDems vote on issues as their manifesto dictates. If they lose a lot of seats, that last option may appear attractive, particularly if the party is strongly divided over continuing with the Conservatives. There is also a strong argument that continuing in coalition with the Conservatives will bring about their eventual demise. However, despite all this, to go with Labour would involve rejecting their current leadership’s advice (and maybe therefore their current leadership), and I suspect that will be too much for them in the end. Having helped them win a seat in the past, I hope I’m wrong. People should by now know the Orwellian character on this government’s spin enough to suspect that if they keep on asserting something, it is almost certainly not true. So it is with the idea of the ‘long term economic plan’. Here is a chart of the original plan for the deficit, and what has actually happened. UK current budget deficit: June 2010 plans and outturns (per cent GDP). The government kept their word on reducing the deficit in financial years 2010-11 and 2011-12, in part through sharp reductions in public investment: cancelling repairs to schools, reducing spending on flood defences etc. But that helped kill the recovery, so they allowed deficit reduction to stall. The 2010 plan put the pace of deficit reduction at the centre of policy making, and the data make it clear that in 2012 the plan changed. Why did mediamacro not call this for what it was. There are two half-truths here. 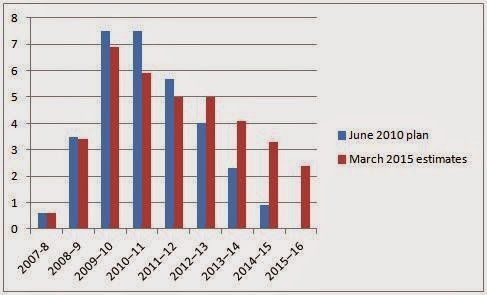 First, austerity in terms of squeezing lots of government departments continued. Welfare reform continued to cause plenty of misery, and food banks continued to grow. So in that very visible sense, the policy of squeezing the state was not abandoned. Second, the Chancellor’s main fiscal rule allowed him to delay austerity in this way (because the form of the rule, since abandoned, was sensible in that respect), so in that sense there was no dramatic change. However in terms of the deficit numbers, fiscal austerity was put on hold in 2012. Not making it clear that the plan had changed was a serious failure. If that call had been made, the Chancellor would have had to account for why he had allowed deficit reduction to stall, and that in turn would have established quite clearly that previous austerity had delayed the recovery. Failure to make that call allowed (and continues to allow) the Chancellor to pretend that the delayed recovery was not his fault, when it so clearly was. (Some journalists also got sidetracked in focusing on OBR forecasts, rather than on the OBR’s assessment of the impact of austerity.) Finally not saying that the plan had changed encouraged the ludicrous claim that the 2013 recovery vindicated austerity, which is tomorrows myth. So this is why the Chancellor keeps on talking about his ‘long term economic plan’, because to admit he changed his plan (as a sensible reaction to the delayed recovery) would open the door to questions about why the plan had changed, and therefore about the damage that austerity had done. It that sense the ‘long term economic plan’ is a key part of the mediamacro myth. Philip Stephens in the FT says the idea that a Labour-SNP understanding would amount to Labour being held hostage by the SNP is nonsense. He is of course correct. In a vote on any particular issue, 50 odd SNP MPs could hardly impose their will on 600 MPs from other parties. More interesting is what this line tells us about the media, about the current Conservative Party, and about what the future might hold if they remain in power. With mediamacro, you generally need some expertise, or some knowledge of the data, to see that the half-truth is very far from the myth, knowledge political commentators may not have. In the case of ‘SNP blackmail’, political commentators have the required knowledge more than most. So for me the success of the scaremongering about a minority Labour government will be an interesting test: is lack of economic expertise or knowledge important in explaining mediamacro, or is control of the majority of the UK press sufficient. There are signs that the scaremongering is working. As Lord Forsyth (former Scottish secretary in a Conservative government) said, his own party is putting electoral tactics above a historic commitment to the defence of the UK union. This can hardly come as a surprise. The Scottish independence referendum was a close run thing, so you might expect a party with the integrity of the nation at heart to tread carefully in the subsequent days and months to heal wounds. Instead, Cameron chose in the morning after the vote to attempt to wrong foot Labour on ‘English votes on English issues’, saying: "We have heard the voice of Scotland and now the millions of voices of England must be heard." It was a gift to the SNP. What does all this tell us about the Conservative Party? Does it tell us that it secretly wants the SNP to get so strong that it could win a future referendum and break up the union? No, what it tells us is that this is a party that is prepared to take large long term risks for minor short term political advantage. As I have suggested on a number of occasions, that seems to be a common pattern in its macroeconomic policy (premature deficit reduction and Help to Buy being two obvious cases). This ignores all the evidence about party before country. A Cameron recommendation to stay in the EU will split his party: after the election a majority of MPs may favour leaving, and a majority of party members already do. In two years time, all the senior figures in the party will be thinking about the elections for Cameron’s replacement. (This is why Cameron’s announcement that he would step down before 2020 was so significant.) In this situation, what are the chances that Cameron will either be equivocal or recommend exit (leaving his successor to negotiate what they can in the way of trade deals)? In that case, what are the chances of the electorate voting to stay in, when the right wing press that helped win the 2015 election for the Conservatives will be in full cry to leave? I would be foolish to say that exit was a probability, but I would be just as foolish to assume that the risk of leaving was small. Voting for a political party that repeatedly puts itself before the national interest is not a good call in the best of times. When it could influence our position in Europe and even the Union itself, it becomes a huge mistake. Too many in the UK seem prepared to walk into that minefield, for the sake of avoiding what would be the mild inconvenience for them of a Labour led administration. I doubt very much that it will make any Labour government give additional preferential treatment to Scotland. The opposition will cry foul on this if that ever happened (and probably sometimes when it does not). As a result, Labour will go out of their way to avoid such an outcome. Would the SNP bring down a Labour government just because they failed to get some minor fiscal advantage? I think that is also highly unlikely. What the SNP will fear most is being seen as the party that brought down a Labour government and helped their opponents into power. 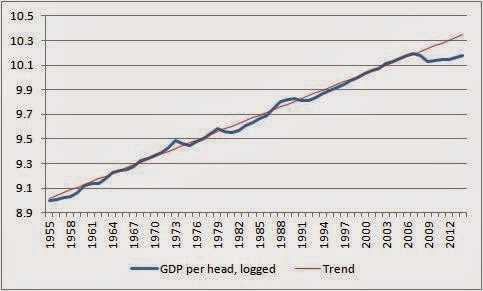 In previous posts in this series (0, 1, 2, 3) we have established that the large increase in the deficit in 2010 was a consequence of the recession and not Labour profligacy - the Labour government was clearly not profligate - and that this deficit was not causing any panic in the financial markets. But surely it is a good idea for the government to tighten its belt when it runs a large deficit, just as individuals who spend more than they earn need to take action? Mediamacro is fond of drawing this analogy. The first point to clear out of the way is that individuals do not always try and ‘balance their books’. People generally spend more around Christmas, and make up any deficit through the rest of the year. You can think about deficits and surpluses that are just the result of the normal economic cycle in a similar way. As the 2010 deficit was a consequence of the recession, can we therefore assume that it will correct itself as the economy recovers? The answer depends on the extent of the recovery. If we returned to the pre-recession trend level of output then roughly yes , but not many economists think that is likely. Instead organisations like the OBR assume that much of the impact of the recession on output will be permanent. We can call the additional deficit that arises from this permanent loss of output ‘structural’. The structural deficit will not go away without some government action. A good rule for an individual with a ‘structural deficit’ is to take action to correct it sooner rather than later, particularly if there are limits to their ability to borrow. Our mediamacro myth is that the same applies to governments: the 'maxing out the national credit card' idea. This is something that every economics student learns is wrong in the first year of their studies. Cutting the government’s deficit reduces aggregate demand, which reduces output. An individual that cuts their spending does not need to worry about the impact their decision will have on the rest of the economy, but the government because it is so large does have to think about this. When the government is free to borrow more at no extra cost (which we have seen that in the UK it was), then it has an important choice about when to start reducing its deficit. Is there ever a good time to reduce the deficit, if output will always take a hit? There are two reasons why some times are much better than others. First, there is now quite a lot of evidence that cutting deficits in a recession has a larger impact on output than cutting deficits at other times (see here and here). Second, theory tells us that cutting deficits need not in principle harm the economy at all if monetary policy can offset their deflationary impact. If the Bank of England can cut interest rates at the same time as the government cuts its spending, the net effect on the economy could be zero. This is a crucial point. Indeed it is the half-truth on which the coalition’s policy of immediate austerity seems to have been based. Modern mainstream macroeconomics says that in normal times governments do not need to worry about the impact their fiscal decisions (like austerity) will have on the economy, because monetary policy will offset that impact. In a speech to the RSA in 2009 this was the idea that the future Chancellor put at the centre of his macro strategy. There was only one problem, which turned out to be extremely serious. Just before he made that speech, UK short term interest rates hit 0.5%, and the Bank of England decided they could be cut no further. They had reached what economists call the ‘Zero Lower Bound’, sometimes described as a liquidity trap. As a result conventional monetary policy was unable to offset the deflationary impact of austerity, and 2010 austerity killed the recovery that seemed to have just started. We had to wait until 2013 for a period of sustained output growth. The Bank did have some unconventional policies that it tried - most notably Quantitative Easing - but as it had no idea how effective these were, they were hardly an adequate substitute for cuts in interest rates. Was the problem of nominal interest rates hitting a floor and therefore not being able to offset the impact of fiscal austerity on output something economists had not foreseen? Is that why the Chancellor ignored this possibility in his 2009 speech? Far from it! Keynes had dealt with the problem in the Great Depression in the 1930s. More recently, the same problem had arisen in Japan in the 1990s. By 2009 a large number of articles had been written about this problem, which is why economists like Paul Krugman and myself were such strong critics of fiscal austerity the moment it was proposed. Most mediamacro myths in this series just need a look at the data and common sense to bust. In those cases it is natural to look at the media itself for the source of the mediamacro problem. In this particular case busting the myth requires some (entirely conventional) macroeconomics. The fact that this macroeconomics has not found its way into political discussion of fiscal policy may reflect other problems in the knowledge transmission mechanism, including the fact that outside the US central banks seem very reluctant to acknowledge the severity of the Zero Lower Bound/liquidity trap problem. It is difficult to overstate the consequences of this. As we have seen, the prospective Chancellor in a 2009 speech setting out the theoretical framework behind his policy ignored the problem, even though it was in front of his eyes. Each household in this country lost on average at least £4000 as a result. Yet incredibly, the same person proposes to make exactly the same mistake after 2015, and it is largely left to a few academic bloggers to point this out. Not a complete yes, because although the deficits caused by this kind of recession would be temporary, they will have raised the level of debt, and the interest on that debt will add to future deficits. We can only ignore that if we soon expect a future boom of equal magnitude, which would be an unwise thing to do. Everyone agrees that the UK Institute of Fiscal Studies is great. It is perhaps best known for its commentary of macro budgetary issues, but it does a great deal of detailed top class research into the micro impact of different forms of taxation, and much more. Today it released its assessment of the different political parties’ plans for spending and taxation policy after the election. It makes two very important points: that the Conservatives plan much greater cuts than the other parties, and that there are important gaps in how much each party have told us about how they will achieve their aggregate plans (with probably the biggest ‘black hole’ with the Conservatives, although do not expect to hear that comment on the BBC). If I have missed a section where the risks of rapid deficit reduction when interest rates are still so low are discussed, I shall remove this post. But if such a discussion is indeed absent, I think I can reasonably complain. Why has the IFS chosen to go long on numbers, and short on ideas? Their analysis is a key resource for the media, and so if the IFS do not even mention such basic macro points when discussing macro policy, it becomes a little less surprising that the media also ignores them. I have always tried to emphasise that I regard the mediamacro problem as a system failure, rather than a problem with particular newspapers or journalists or editors. I have also tried to stress that I remain unclear as to what the critical drivers of this problem are: a biased print media, the role of the City or something else. That something else could potentially include, at least in the UK, the way academic ideas fail to be transmitted to the media by academic think tanks. There are two half-truths here. First, everyone remembers talk of a housing boom, and a housing boom sounds pretty similar to a more general economic boom. But more seriously, the idea that there was a huge boom in 2007 appears to be backed up by data from the IMF and OECD. Let us take each in turn. 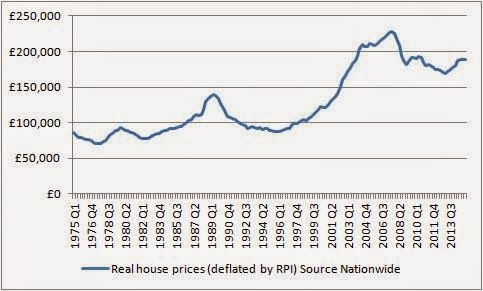 This chart of house prices clearly shows a housing boom in the middle of the last decade. But does it indicate a general economic boom in 2007? There are two problems: there is clearly an underlying trend in the data, and house prices rose most rapidly at the beginning of the decade. When you take any trend into account, the middle years of that decade look like a plateau. The upward trend in house prices is likely to be due to two factors: a growing mismatch between demand (encouraged in part by inward migration) and supply (very few new houses being built), and lower real interest rates. (The reason why low rates are important is explained here, and the link with demand and supply here.) As all these factors can also vary in the short term, this indicates that the house price cycle need not always be correlated with the more general economic cycle. The clearest indication of this is what has happened to London and South East house prices over the last two years, which are now well above 2007 levels. Does that mean the region is in the middle of an even more massive boom? Of course not. If you look at both the OECD and IMF’s current measures of the output gap (the difference between actual output and the level that would keep inflation constant), they suggest a large positive gap for the UK in 2007. (3.5% in the latest OECD Economic Outlook.) That is a pretty large boom. The problem here is that in 2007, the OECD only thought the output gap at the time was less than 0.5%, which is no boom at all. Why the change in view? The answer is the recession, and the UK’s slow recovery. To cut a long story short, the OECD in effect retrospectively fit a gradually moving trend through the data (for productivity rather than output, but it comes to the same thing), so the longer the UK fails to catch up with its pre-recession trend, the more the OECD has to bend that trend over the past. The more it bends the trend, the more 2007 looks like a boom. This gets us to the key point as far as Labour profligacy is concerned. What is relevant to this issue is not what we think about the 2007 UK economy today, but what the general consensus was at the time. As we have already noted, the 2007 OECD Economic Outlook thought at the time that the UK economy was pretty close to trend. As far as I can see, this was a consensus view. The IFS Green Budget for 2007 had an output gap of effectively zero. The IMF’s Article IV assessment published around Budget time in 2007 came to a similar conclusion. The reason this was the consensus view is the data noted in the previous paragraph. One final look at the numbers. If we assume real growth of 2.5% (again a consensus view at the time) and 2% inflation, then a debt to GDP ratio of 40% would imply that the sustainable deficit was 1.8% of GDP. As the estimate of the output gap at the time was around zero, there was no reason to adjust this for the state of the cycle. The actual deficits for financial years 2006-7 and 2007-8 were slightly over 2.5% of GDP. The difference is what I call mild imprudence, and would have been fairly easily to correct in subsequent budgets. By 2009-10 the deficit had risen to 10.2% of GDP because of the recession. So the deficit in 2010 was a consequence of the recession, not Labour profligacy before the recession. And if you cannot shake off that idea that Gordon Brown was profligate, one final set of figures. Between financial years 1979 to 1996 (the 18 years of Conservative government), the deficit averaged 3.2% of GDP. From 1997 to 2007 it was 1.3%. Now maybe the Conservatives were a bit unlucky with having two recessions on their watch, so the equivalent cyclically adjusted figures are 2.6% and 2.1%. One last time: Labour fiscal profligacy is as mythical as the unicorn. My New Statesman article that provides a summary of this series is also now available online. Oh dear – ‘the Labour recession’. That would be the global financial crisis that originated with US subprime mortgages! Calling this the Labour recession is just stupid, and is something I would never say. It is very unfortunate (and I hope it is just a misfortunate) that Stewart Hosie appeared to suggest that I had said or implied that. Whatever the intention, it indicates that at least some in the SNP are still in the business of making highly misleading statements to advance their cause. While on the subject of the SNP and this election, let me make one final point, just in case any prospective SNP voters read this. In the quite likely event that the Conservatives get more seats than Labour, but less seats than Labour and the SNP combined, in a situation where either side would need LibDem support Nick Clegg has made it clear he will talk to the Conservatives first. That will almost certainly lead to the current coalition government continuing. Clegg’s reasoning for doing this makes little sense, but the SNP cannot influence Clegg’s decision, and I suspect nor can his party even if they were minded to. If that comes to pass, then every vote for the SNP rather than Labour that loses Labour seats becomes a vote to continue with the current government. That is not an opinion, but a factual statement. So, to be consistent with his own logic, I think Stewart Hosie would have to call this election result the SNP’s Tory-LibDem second term.